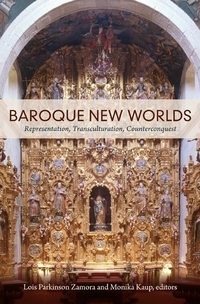 Baroque New Worlds traces the changing nature of Baroque representation in Europe and the Americas across four centuries, from its seventeenth-century origins as a Catholic and monarchical aesthetic and ideology to its contemporary function as a postcolonial ideology aimed at disrupting entrenched power structures and perceptual categories. Baroque forms are exuberant, ample, dynamic, and porous, and in the regions colonized by Catholic Europe, the Baroque was itself eventually colonized. In the New World, its transplants immediately began to reflect the cultural perspectives and iconographies of the indigenous and African artisans who built and decorated Catholic structures, and Europe's own cultural products were radically altered in turn. Today, under the rubric of the Neobaroque, this transculturated Baroque continues to impel artistic expression in literature, the visual arts, architecture, and popular entertainment worldwide. Since Neobaroque reconstitutions necessarily reference the European Baroque, this volume begins with the reevaluation of the Baroque that evolved in Europe during the late nineteenth century and the early twentieth. Foundational essays by Friedrich Nietzsche, Heinrich Wolfflin, Walter Benjamin, Eugenio d'Ors, Rene Wellek, and Mario Praz recuperate and redefine the historical Baroque. Their essays lay the groundwork for the revisionist Latin American essays, many of which have not been translated into English until now. Authors including Alejo Carpentier, Jose Lezama Lima, Severo Sarduy, Edouard Glissant, Haroldo de Campos, and Carlos Fuentes understand the New World Baroque and Neobaroque as decolonizing strategies in Latin America and other postcolonial contexts. This collection moves between art history and literary criticism to provide a rich interdisciplinary discussion of the transcultural forms and functions of the Baroque.